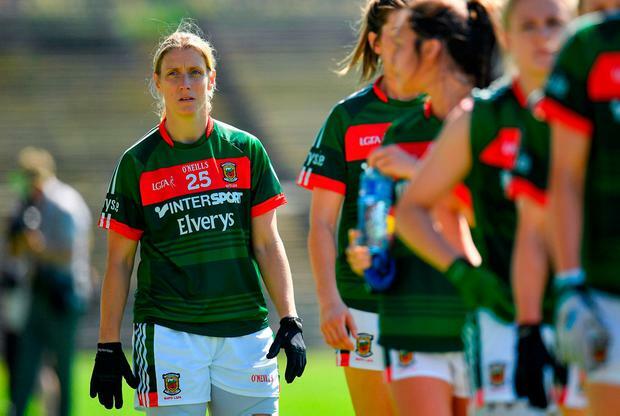 Cora Staunton says she is relieved to have a competitive game under her belt with the Mayo ladies as she familiarises herself with the round ball once again. After her first season playing Australian Rules with the Great Western Sydney Giants, Staunton (35) took some time off to recover from the surgery she had on the nose injury she sustained playing in Australia. But after 60 minutes in the Connacht final defeat to Galway, Staunton is excited by the All-Ireland Series ahead. The Carnacon player will return to Australia once her club championship campaign finishes, but she is focused on maintaining her ever-present championship run with Mayo, which stretches back 22 years and 68 games. She kicked six points for Mayo last weekend, but also uncharacteristically fired a handful of efforts off target too. "It's just different, going from different training. I had a couple of weeks off over there. I had an operation on my nose and had to take a couple of weeks off training. It's been a long 19 or 20 months," said Staunton, whose next test is against Cavan on July 14 in their first Group 4 round robin game. "Coming back in changing ball and things like that it took me a little while to get up to the pace of the game. But I am back six or seven weeks now. We have a few challenge matches under our belt too. "Nothing prepares you for the heat of battle and championship matches. Good to get 60 minutes or more under my belt there. It's a change but I enjoy being back. "The fitness is fine, skills-wise is probably the biggest thing. Going from the oval ball back to the round ball." Subscribe to The Throw-In, Independent.ie's weekly Championship podcast, for the best in GAA discussion and analysis every Monday, with some of the biggest names in football and hurling from Joe Brolly, Tomás Ó'Sé, Brendan Cummins and John Mullane. Subscribe and listen to The Throw-In podcast on iTunes or SoundCloud.